It’s that time when every expat’s thoughts are presumed to turn to their home country. I’m talking about the World Cup Finals, and the notion that we are all birth patriots at heart. Why then, do I find myself rooting every four years more so for the USA than England? There are some obvious pop psychology explanations. I took citizenship back in 2009 and now own an American as well as a British passport; having lived over half my life in the States, it makes sense that I might support my adoptive home country. Plus, I like to believe I have always been ambivalent about English nationalism and the flag that flies with it – partly because of Empirical history and racism, but also because I’m half-Scottish to begin with. There’s the England football team’s relentless capacity to under-perform and disappoint; it’s one thing to love your local club when they routinely let you down, it’s another to love a national team for the same reason, especially when it features plenty prima donnas you typically enjoy putting down on a weekly basis (but none of your own club players). Finally, since moving to the Catskills, I have become somewhat more isolated in my footballing viewing habits: there isn’t the massive expat community – and the pubs that go with it – to bring me along on its tide. But none of that would explain, for example, why I was so truly proud of being British during the wonderful London Olympics, or why I barely give a toss about the USA’s performance in any other global competition. Nor would it excuse ongoing American empire and racism; I’m no more liable to wrap myself in the Stars and Stripes than the Union Jack or Flag of St. George. No, there’s a specific reason I’m so fond of the USA football team. It extends back two full decades, to 1994, the year the nation hosted the World Cup. I had just signed on as American producer for a British TV show called “Passengers,” an hour-long, generously funded offshoot of Rapido that was keen to commission all forms of newsworthy pop culture items. It was spring already, and we were in the countdown to the World Cup Finals, at the stage where squads were about to be trimmed down to their final 22. The US coach was Serbian journeyman Bora Milutinovic, leading his third nation in just three Finals, and his task of assembling a respectable US team appeared daunting, given the lack of star names, let alone a functioning domestic league. To compensate, the US Soccer Federation had retained a number of college-groomed players on a two or one-year contract leading up to the tournament, making them full time members of a US National Team that played friendlies as often, it sometimes seemed, as your local league club. The domestic media woke up to the fact that the world’s biggest sporting tournament was coming to its shores, honed in on possible poster boys amidst this ramshackle squad, and the visage of Alexei Lalas, a heavily goateed rock ‘n’ roller, started showing up in various newspapers and TV shows. He wasn’t good enough to guarantee his place in the final 22-man squad, but Lalas had charisma, and that had to count for something. I pitched a story on him, and my producers bit. Better yet, they offered to fly me out to the US team base in California to film it. On May 4, 1994, my original cameraman from NYC, a Polish guy by the name of Felix who had recently moved west to work in Hollywood, picked me up from my hotel in Los Angeles, and we drove up to the San Luis Obispo area, and the team’s headquarters. The US Soccer Federation had proven almost pathetically easy to deal with, desperate as they were for positive coverage – especially in the UK – and we were more or less left free to film on the touch lines as the over-sized squad went about their training. Bora was there, and he cut a clearly authoritative figure with the players, but he wasn’t distant; we interviewed him as part of the story. 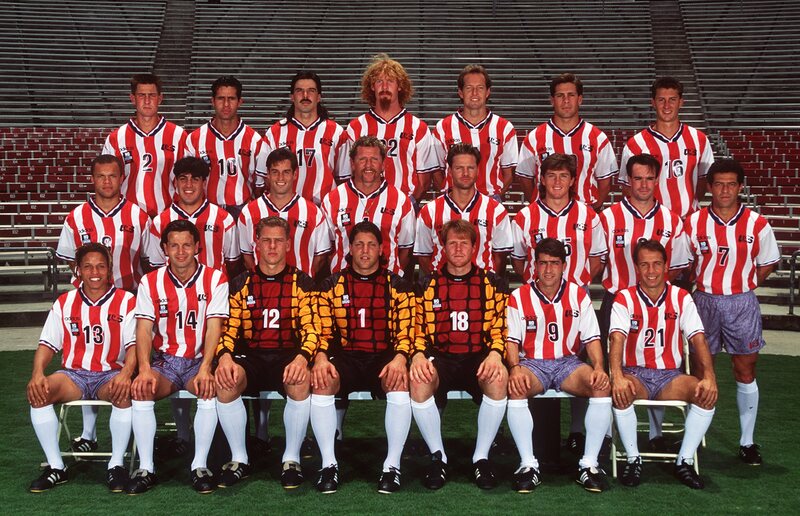 Some of the players that day had World Cup Experience from Italia 1990 (Tony Meola, Marcello Balboa, Paul Caligiuri); a few more, including Lalas and Joe-Max Moore, had played for the USA U-23 side at the Barcelona Olympics in 1992. But the vast majority of players on the training field were essentially unknown and unproven in top-tier competition. In all of six weeks, they hoped to be representing their country in front of the largest crowds in World Cup History, to television audiences in the hundreds of millions, in a tournament that was destined to have a profound impact on the sporting culture of their home nation, and yet you would never have known it by their countenance. They were all ridiculously relaxed and super friendly, the very antithesis of the modern era football star. Rather than allow this to confirm the pervasive wisdom about the sport in America – that the side was no good and that nobody cared anyway – I took it the other way: that here were people playing the sport because they loved it, rather than because they were earning a fortune from it. After all, the problem with the sport in the States was not its lack of grass-roots popularity (soccer is the most-played sport amongst children in America), but its lack of professional opportunities. Without a respectable league, even the greatest talent had nowhere to take their skills after playing in college; additionally, by that point they were basically too old to start out in Europe or South America. Yet the players we met in San Luis Obispo had put aside their college degrees to play on a widely derided national team for a modest wage, knowing perfectly well that any day now, they might be cut from the squad – in which case they would probably have to go knocking on doors, their professional dreams shattered, with their non-footballing resumes in hand. 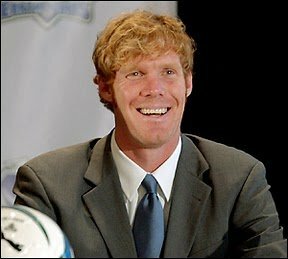 Alexei Lalas could easily have been amongst them, and he had the added dilemma of the fact that he had left college, for the US national team, before finishing his degree. This lack of security would explain why he had not yet quit his night job, playing in the bars as a musician. Even as the World Cup loomed closer on the horizon, he had kept his band, the Gypsies, on hold back east. His dual lifestyles appeared almost absurdly laughable, but as he stated to us over and over again that day, his love of music was equal to his love of football. If he could make a career out of either, he would be a happy man. Like quite a few in the US squad, Lalas (who had been born in Michigan) was the product of a thriving New Jersey soccer scene, having attended Rutgers University in New Brunswick. And as with many of his squad-mates whose futures were equally uncertain, he resided temporarily in what passed as an overgrown college boy’s environment, sharing a small rented apartment with another World Cup hopeful. It was back at that apartment, amongst discarded clothes and pizza boxes, that we set up the cameras again and interviewed him, this time with the guitar. It was evident immediately that neither his image, nor his musicianship, was a put-on; he was the real deal. 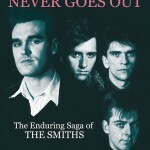 He had the charisma of a rock ‘n’ roll star, but the modesty of an everyman; between the two, he had already earned the support and enthusiasm of his fellow World Cup hopefuls, who seemed to intrinsically understand that the positive publicity he was generating was positive publicity for all of them. 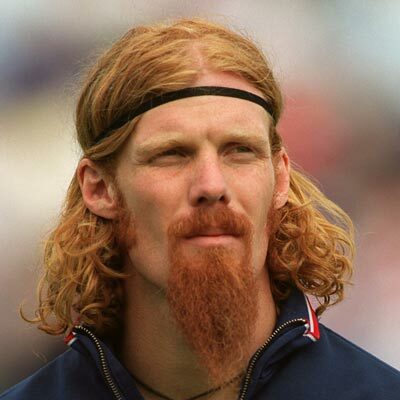 Lalas played us a song or two; I don’t remember them being particularly notable, and given that goatees were two-a-penny in those awful grunge years, I came away hoping that he’d make it on the football field instead. It’s worth pausing for a moment to imagine this scene taking place in any other nation, just six weeks before the Finals: the vast majority of a host nation’s World Cup Squad walking casually into a pizza restaurant, ordering up slices, pulling up chairs, and craning their necks to watch a match on an overhead TV. The owner barely batted an eyelid; the locals seemed more non-plussed than impressed. Lalas may or may not have been considering what might have been – he had spent a few weeks with Arsenal in the winter of 1992 before being unceremoniously cut and sent home – and what might yet be to come, should the same blunt determination of his talents be pronounced again over the next couple of weeks. Either way, the footballing entertainment was cut short: because the pizza place was in the Valley, and it didn’t have cable, the reception was atrocious, and a few minutes in, a conversation ensued amongst the players. Bora had insisted they all watch the match and nobody, it seemed, wanted to risk doing anything to lessen their chances of making the squad; at the same time, there was no point staying put. Eventually, one of the few players resident in California, with some form of reliable TV reception and presumably a large enough living room, volunteered his pad, the players piled into their everyday cars, many of them sharing a ride to conserve gas money, and they waved us goodbye. They’d been charmers, pretty much every last one of them. It was hard not to love them. Three days later, the US team hosted Estonia in one of its unending pre-tournament friendlies, in Fullerton, just outside LA. I was still in the region, conducting other shoots, and Felix and I joined a crowd that barely topped 2,000. The States won 4-0, and we chatted with Lalas and some of the others on the touchline afterwards. They were thrilled to see we hadn’t just been doing our job, that we were proper fans. We were just trying to imagine these same players rising to the challenge of the Finals. Precisely a month after we had first met with them, I was back out in California for another shoot, which coincided with the USA’s last pre-tournament friendly, this one at the Pasadena Rose Bowl, where I would return once more, a month later, to watch the World Cup Final. Due, no doubt, to the paltry attendance against Estonia, Felix had insisted we could buy tickets at the gate; his calculations failed to take into account that the States’ opponents that day were Mexico. A crowd of well over 100,000 descended on the Rose Bowl, and of the 92,405 who made it inside (we were not among them), barely a thousand or two could be heard cheering for the home country. The USA nonetheless won the match, 1-0, with a goal from Roy Wegerle, one of three Americans then playing in the English leagues. But Lalas was there, too. He had made the squad. Given that he was assigned number 22, one has to assume he was the last to do so. Typically, the USA’s victory that day was written off as some kind of freak, and the final 22-man squad embarked on their group matches as probably the most under-rated home nation in history. As such, and having hung out with them in such ridiculously low-key circumstances, I was more than happy to support them. My task was made somewhat easier by the fact that England had not even qualified. As you may recall, depending on your age, the US shocked the international footballing world by winning its second group game, against South American hotshots Colombia, 2-1. And though they were eliminated in the last 16, it was to the eventual winners, Brazil, by just a goal to nil. The tournament itself was considered a resounding success, not just for its record crowds and excellent organization, but for its impact on the domestic front. It made stars out of Lalas and Cobi Jones (both of whom signed contracts in Europe), brought the sport into something close to the American mainstream, and generated the US’s own Major League Soccer, albeit a season later than intended. 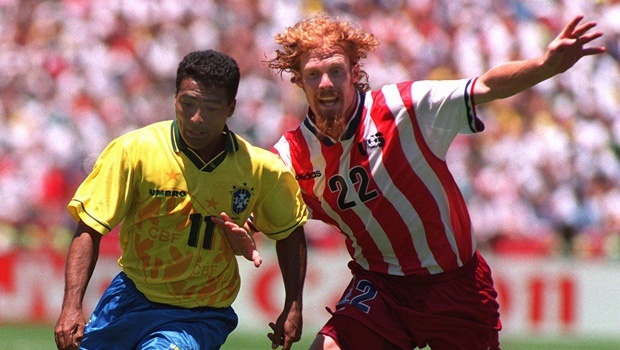 Alexei Lalas as he never dared imagine: defending against Brazil’s Romario in the 1994 World Cup in the USA – on July 4, no less. As for the USA, they have qualified for every World Cup Finals since. Admittedly in 1998, they lost all three group matches, but that only confirmed their underdog status, and I couldn’t help but continue to root for them. In 2002, in Japan/South Korea, they rewarded this faith by making it to the Quarter-Finals for the first time, alongside England. I watched both teams get eliminated through the same very long night (and morning), and it seemed to me that the USA put up just as good a fight in losing to Germany as England did against Brazil. Same thing again when, eight years later, in South Africa, my two passport nations were drawn in the same group, and it was the USA who, against the British bookies’ odds, came out on top. This time, both sides went out in the round of 16, where England were absolutely hammered by Germany, whereas a typically spirited and tenacious US side took Ghana to extra time. Few people “back home” wanted to admit this might mean that the two nations were of parity. After all, England claims to have invented football and boasts the premier league in the world; the standard of play in the MLS is still barely on a par with the English League 1, at best. In England, football is more than the national sport, it’s a way of life; it is neither in the USA. The English national players are household names in their home country, whereas most of my neighbors in the Catskills wouldn’t be able to identify Tim Howard or Clint Dempsey even if wearing their national shirts. But as any football commentator won’t hesitate to remind, the only statistic that matters is the final score. On that ultimate criteria, those American underdogs have done alright over the years, and the fact that, even in 2014, they have to earn their respect – the knowledge amongst the players, the coaching staff and the fans that both international and domestic expectations do not come easy – makes them, for me, a continued worthy cause. I’m always hopeful that England will once again play like a truly great team, justifying their international renown, and I continue to cheer for them (in vain). But not as loudly as I do for the USA. Lalas as he is now: middle-aged respectability. And finally with that college degree. 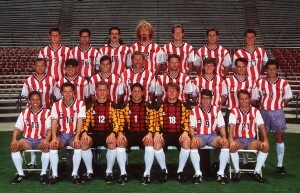 PS: Alexei Lalas signed to Padova in Italy’s Serie A after World Cup 1994. He returned to the United States two years later to join Major League Soccer’s New England Revolution. He later moved to Los Angeles Galaxy, winning the CONCACAF Champions’ Cup and MLS Cup before retiring in 2002. His footballing experience and intelligence ensured to a successful secondary career as President and General Manager of the San Jose Earthquakes, New York Red Bulls and Los Angeles Galaxy. He can currently be seen nightly as a World Cup Finals analyst on ESPN and ABC Sports. And in May 2014, having taken advantage of the newly-introduced online courses and enrolled back at Rutgers, he finally earned a degree in English – with, appropriately, a minor in music.